I come by my weirdness honestly, as I’m the latest in a long line of “unusual” women in my family. When I tell people I spent a lot of time locked away in closets during my childhood, talking to invisible friends, they assume I’m a little twisted. That’s probably true (grin), but the early experiences also made me more comfortable with my inner world and my imagination than with the outer world. By the time I was a young teenager, my fascination with the Tarot became another intriguing thread in the tapestry of my life. Talking to ghosts, sensing things before they happen, reading peoples emotions, feeling energy – hmmm, what kind of books should I write? Let’s just say paranormal was a no-brainer. Along with my love of all things spooky, I also had an interest in human psychology. What makes people tick? And why do we make the odd choices and decisions we do? After changing my undergraduate major back and forth a few times from music to psychology, I finally decided I loved singing but didn’t have the urge to teach others about it. So, psychology it was. It took me a long time as a single mom to make my way through undergrad and graduate school, but I finally completed my Masters Degree in Counseling Psychology and opened a psychotherapy office. As the years passed, I added skills like hypnotherapy, sound healing, and personal coaching, and expanded my business to include both psychic/intuitive/empathic and therapeutic services. I’d spent years writing nonfiction articles, columns and teaching materials, but when the fiction bug bit me several years ago, I went down like a skyscraper in an earthquake. Writing about all the magical, mystical and bizarre things in my head was more fun than, well, almost anything. I knew there was a reason I’d spent so many years in those closets! 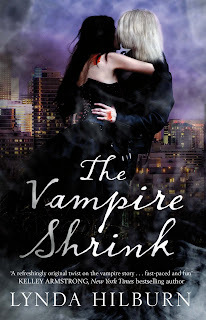 The idea for The Vampire Shrink came from a phone call and a client session. The mother of a young woman, obsessed with becoming a vampire, contacted me to ask for a referral in her part of the country. I’d also recently met with a client who made outrageous and extraordinary claims about belonging to a supernatural group. I went home that night and began writing, and Dr. Kismet Knight, Ph.D. was born. It’s a pleasure to bring all my various categories of knowledge to my writing. The psychologist heroine in The Vampire Shrink is loosely based on me. Well, okay. She’s an idealized version of me: thinner, younger, prettier and sought after by lots of gorgeous guys. She lets me live vicariously through her, and we’re both having a ball. Devereux’s character originally was going to have dark hair. That was my first vision of him. But he insisted on being blond. He also refused to give up his European accent, no matter how many times I tried to make him more contemporary. With these two willful characters, who knows what will happen next in the series? I just type as fast as I can, trying to keep up! 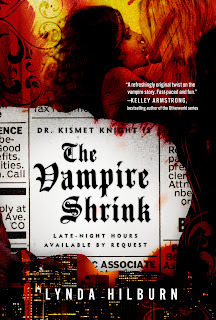 The USA paperback of the new The Vampire Shrink can be pre-ordered at Amazon.com and/or BN.com now! It is fascinating to read the inspiration to your book, I love hearing the story behind the story.